Marc-Antoine Charpentier at Versailles: Messe et Motets Pour La Vierge (1702). Le Concert des Nations in 2005. Intriguing facts coincide in this live early music performance of the Messe et Motets Pour La Vierge (Mass and Motets for the Virgin) by Marc Antoine Charpentier (French, 1643-1704) and the Palace of Versailles in whose Royal Chapel it was recorded in 2007. 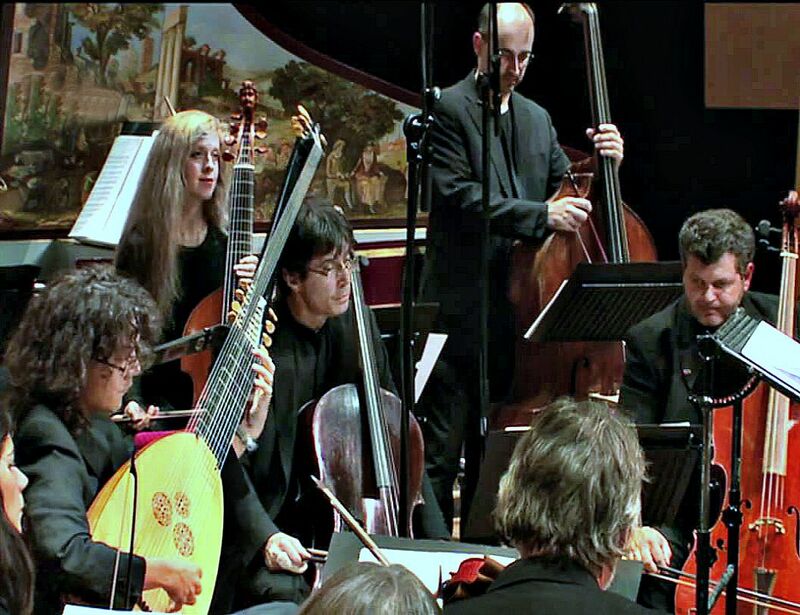 In the Jules Hardouin-Mansart-designed chapel of 1699 (it was completed in 1710) is performed some of the greatest music ever composed by early music ensemble Hespèrion XXI and period instrument orchestra Le Concert des Nations led by Jordi Savall. The ninety-one minute music video in this post is directed by Olivier Simonnet and broadcast by MEZZO. Only fourteen miles west of Paris, there are many ways to visit Versailles’ château and grounds because it is very big and expansive. The château has over two thousand windows (count: 2,153). In 2012 when former Chicago Bulls superstar Michael Jordan sold his house he listed it at $29 million. For that price the residence boasted 32,683 square feet on seven acres near Chicago. What about Louis XIV’s Versailles? The royal château is over 720,000 square feet on two thousand acres. The visitor who wanders the 30 rooms of Jordan’s house could wander Versailles’ twenty-three hundred rooms. To be expected, there is much to see inside the château: by one count, 6,123 paintings, 1,500 drawings, 15,000 engravings, 2,000 sculptures and 5,000 pieces of furniture. Most of the palace was built in the 1670s. It is interesting to host Charpentier’s Messe et Motets Pour La Vierge in the Royal Chapel. 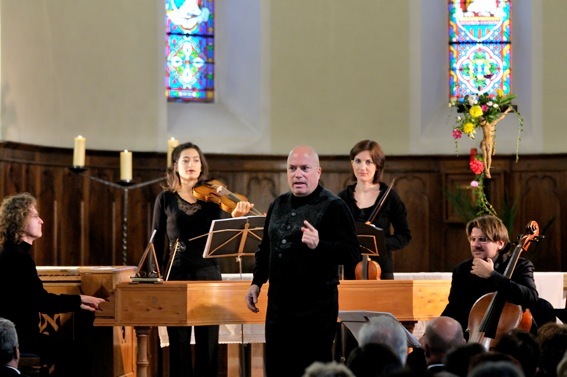 Composed in 1702, this brilliant new liturgical music of the time is performed in architectural space that was also new—to be completed in 1710 by the First Architect to the King’s brother-in-law because Mansart died in 1708 at nearby Marley-le-Roi. What is Charpentier’s composition of Messe et Motets Pour La Vierge about? During the counter Reformation in the sixteenth century, the Catholic Church renewed its devotion to Mary, the Mother of Jesus. Charpentier was a prolific composer who had a diverse list of clients in Paris and the artist continually adapted his work. His religious music is complex for its musical relationships and its theological structures. Charpentier’s complete composition is not trivial. It supports varied expressions of Marian devotion—specifically, a didactic dialogue in her honor (Canticum in honorem Virginis Mariae Beatae homines…), a sorrowful Virgin at the foot of the Cross (Stabat mater dolorosa), a litany of the Virgin, and a great Mass in her honor for God’s glory (Assumpta est Maria…). Added to this theological variety are the different musical styles for soloists, chorus and orchestra. Charpentier’s final product is sublime and leads directly to the Mass worship on the Feast of Mary’s assumption into heaven which is August 15. 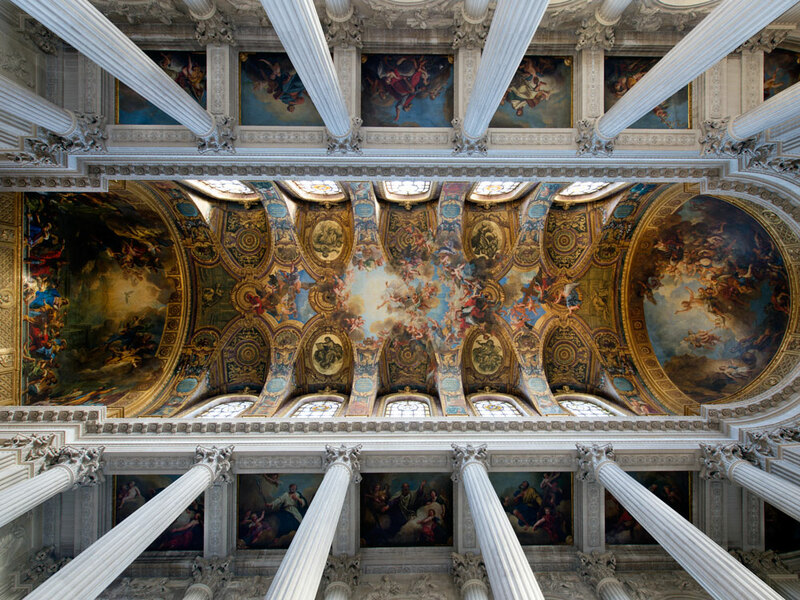 The vaulted ceiling in the Royal Chapel at Versailles (1699-1710). Hardouin-Mansart (1646-1708) designed it without transverse ribs so to create a unified surface, It is dedicated to the Holy Trinity: iGod the Father in his Glory by Antoine Coypel (1661-1722) is in the center. In the apse is The Resurrection by Charles de La Fosse (1636 – 1716). Above the Royal tribune is The Descent of the Holy Ghost by Jean-Baptiste Jouvenet (1644– 1717). 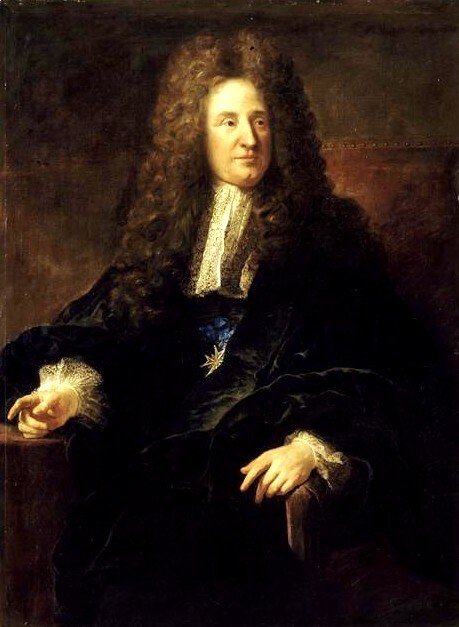 Portrait of Jules Hardouin-Mansart (1646-1708), Premier architecte du Roi by François de Troy (9 January 1645 – 21 November 1730), 1699. Palace of Versailles. This entry was posted in ARCHITECT, Architecture and Design, Art, French art, Music and tagged Arianna Savall, Bruno Cocset, Charles Zebley, Charpentier, Château de Versailles, Daniele Carnovich, Elisabetta Tiso, Emmanuel Bardon, Guido Balestracci, Hespèrion XXI, Imke David, Jean François Novelli, Joanna Valencia, Jordi Ricart, Jordi Savall, Judit Scherrer-Kleber, Jules Hardouin-Mansart, Le Concert des Nations, Lluis Vilamajo, Luca Guglielmi, Marc Antoine Charpentier, Marc Hantai, Messe et Motets Pour La Vierge, Motets, Pascal Bertin, Raphaële Kennedy, Xavier Diaz-Latorre, Xavier Puertas, Yves Bergé on December 16, 2013 by jwalsh2013. 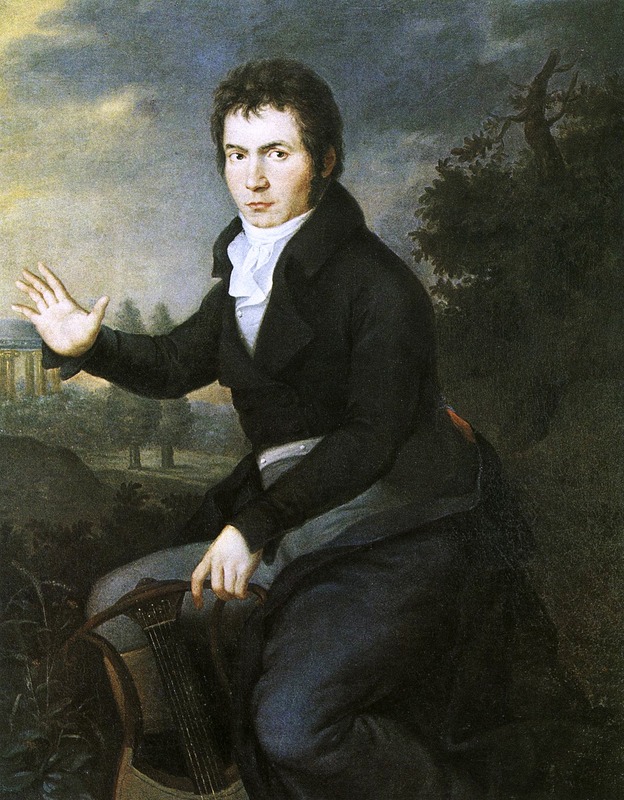 Revolution of 1800: the early “new” music of young Ludwig Van Beethoven. Ludwig van Beethoven, 1804/05, Joseph Willibrord Mähler (German, 1778-1860), Wien (Vienna) Museum. Ludwig van Beethoven’s birthday is December 16. Throughout the 1790s Beethoven composed in the drawing-room tradition but around his 30th birthday in 1800 he was already telling friends he was determined to “open a new path” for music. Resistance to the young, gruff composer and his new music’s coarse vibrancy—a “music of man” expressing every aspect of human living including its suffering, its excitement, and, above all, its engagement with the world—frequently came from the quarters of style galant musicians who were used to playing the cool and shiny music of C. P. E. Bach (1714-1788), Wolfgang Amadeus Mozart (1756-1791), and Joseph Haydn (1732-1809), the last of whom was still living when Beethoven was working his musical revolution. These musicians’ resistance to Beethoven often extended to his audience who were mainly young people with a taste for a revolutionary sound. Beethoven’s work is famously divided into three epochs: his own twenties (before around 1800); his thirties to mid-forties (the so-called Middle Period of around 1805 to 1818 or so); and his final decade. Ludwig van Beethoven (1770-1727) lived to be only fifty-six years old. Profound changes in his art and personal life in his late forties and fifties led to the creation of his—and by inheritance the world’s—greatest music but such mature works changed the perception of his first “new” music after 1800. To what degree is Beethoven’s earlier music a prolongation of the “old” music more than his mostly young auditors first perceived it? Here is a great performance of a part of Beethoven’s critically contentious early “new” music. It is the first movement of the Fourth Symphony in B Flat Major written in 1806 performed by the Royal Concertgebouw Orchestra led by Carlos Kleiber. (10:02 minutes). SOURCES: Peter Watson, The German Genius: Europe’s Third Renaissance, the Second Scientific Revolution, and the Twentieth Century, HarperCollins, 2010; Romain Rolland, Beethoven the Creator, Garden City Publishing, Garden City, NY, 1937. This entry was posted in Music, World History and tagged Carlos Kleiber., Fourth Symphony in B Flat Major (1806), Ludwig van Beethoven, Royal Concertgebouw Orchestra on December 13, 2013 by jwalsh2013.